The first ever Little Free Library Festival will take place this Saturday, May 21st, in Minnehaha Park in the Twin Cities area. More than 100 representatives of various Little Free Libraries will come together to celebrate the organization’s mission: to build community and promote literacy. Tony Bol, events manager for Little Free Library and event organizer for National Public Radio, organized the festival. Tony is the brother of Todd Bol, founder of the Little Free Library organization. What began in 2009 as a tribute to Bol’s mother, who was a school teacher, has become a worldwide phenomenon with 36,000 Little Free Libraries established in all 50 states and 70 countries. The first Little Free Library was in the shape of a little red schoolhouse and was placed on Todd Bol’s front lawn. Nonprofit Quarterly has been following the growth of, and issues facing, the Little Free Library concept. Coverage in 2015 highlighted 10-year-old Zoey Halbert of Colorado Springs who spent her 2015 spring break creating a Little Free Library. Zoey started the library because the school she attended did not have a one at all. A few months before that, Cleveland’s Madison Reid shared her passion for reading and Little Free Libraries by stating, “The world needs books!” Reid’s mother is the steward of her own Little Free Library. The Little Free Library movement has not been without its troubles. In February of 2015, Nonprofit Quarterly covered the challenges faced by a Little Free Library registered with Ricky and Teresa Edgerton in Shreveport, Louisiana. The Edgertons were notified that the library violated a zoning ordinance, which stated that libraries could only be in operation in a commercial zone. Thanks to the outcry from community members, including an artist who placed books in a tree in her front yard as protest to the zoning law, the laws were redesigned to allow Little Free Libraries. 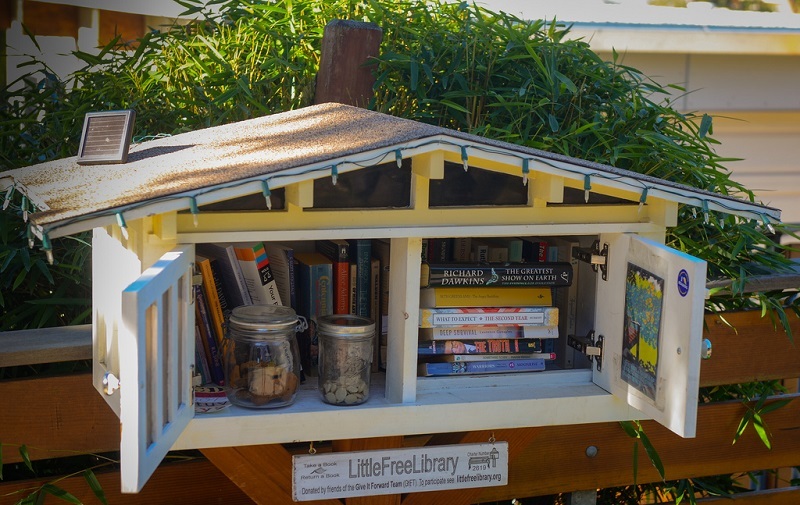 Another issue, covered by The Atlantic, came about in Los Angeles when Peter Cook was told to remove his Little Free Library from the curb outside of his home. The structure was deemed an obstruction. Authorities were notified about the library when neighbors began to complain. Officials were hoping to work with Cook to obtain grant funding to pay for the permit fee that would allow the library to remain. A third issue arose in Kansas when young Spencer Collins, who wanted to share his love of reading with the community, was forced to relocate his own Little Free Library from his front yard to his garage. Complaints were lodged about the Library because it was considered an illegally detached structure. A literary canine contest and parade for which pet owners can dress their dogs as their favorite author or fictional character. Poetry readings from finalists of a local high school poetry contest. Harry Potter trivia games on the half-hour throughout the day. A traveling social art project featured at the NY Art Book Fair celebrates literary works by Black female authors.